One night last week, two of my BFFs and I channeled our younger, more hip selves, and went to a concert. A real concert. Not a tribute band in a small local theater. No, we went for the gusto and traveled 90 minutes to join several thousand other screaming and singing fans to see Maroon 5. We had planned this outing months in advance, part of our self-declared “Stomp the Frump” campaign. We three dressed in our coolest least-mom-ish attire. Mom Jeans were exchanged for faded trendy denim, and accompanied by what else, but black jackets and big jewelry. When my son said “hey, you guys look pretty good” I felt that we had achieved our non-frump looks for the evening. Heck, I even took the time to crimp my hair. We were three real women on the town, ditching all other responsibilities to just plain have fun and unabashedly prove that we are card-carrying members of the Adam Fan Club. Ok, maybe we don’t really have fan club cards, but at the pub we went to for dinner, we did get free signs from the local radio station to hold up at the concert to proclaim our devotion. And for the most part, we adhered to our pact to avoid “old lady” topics like medical issues and age complaints. Although we did have a bit of a discussion about retirement planning over dinner… Luckily, we don’t think anyone overheard us. The show was amazing. We didn’t have the most perfect seats, but from our perspective, it was awesome. It was a great night, even if the ride home in lousy weather was long and tiring. We had accomplished our anti-frump goal and had photos and mild deafness to prove it. In what I now consider a rather brilliant move, I took the following day off. I know darn well that I no longer can easily bounce back from a night that involves getting home in the wee hours of the morning. I attempted to respond nonchalantly with a “me too” then went on to other topics – because I know all too well that making a big deal of any comment out of a teenager’s mouth is a bad idea. But his words stuck with me all day. First my heart was thrilled, and I thought “wow, maybe I really am still cool, and he still wants to be around me sometimes.” Then, I felt a bit guilty. When I grew up, my mother was a stay-at-home mom. I remember coming home from school, propping myself up in the hallway between the kitchen and her sewing area and babbling away to her about my day. She was there while I had an after-school snack, or while I had a friend over, or when I needed help with homework. (We went to mom for help with Social Studies and English, but waited for Dad to come home if we needed help with Math and Science.) Most of my friends also had a parent home after school. Having two parents who worked outside the home full time was still fairly rare. I remember hearing the phrase “Latch Key Kid” uttered in hushed tones between other parents, as if these “poor, lonely children” would be destined for a life as hoodlums because they went home to an empty house for a couple of hours in the afternoon. Fast forward to my adult life. Ten weeks after giving birth to my beautiful baby boy, I returned to work full time. And haven’t stopped since. We were lucky to be able to hire a family friend to care for him while he was young, when we were both at work. She became in a sense his adopted grandmother, and stayed on with us until we felt he was old enough to be home alone after school. Yes, at that point, I had my own Latch Key Kid. I know several other real women who after having children, decided to either stay home, or work part-time to be home after school. They made the choice to potentially get by with less income, or “give up” their careers to be more present in their children’s lives. I commend those women for making that decision. So as I recuperated from my fun night out, got some things done around the house, and of course made brownies, I wondered if I had done a disservice to my son by rarely being there when he stepped off the bus every afternoon over the past few years. But I realized that he didn’t know any other way. He had easily learned how to let himself in to the house, lock up behind him, get himself a snack, take care of the dog, and stay safe and entertained until we got home every evening. When he got home this particular day, we chatted briefly, we went out and shoveled together, then he did what he does every day – went up into his cave –err, I mean room – and did his homework then played video games online with his friends. Quite content and happy. He truly has learned to appreciate and enjoy his time to himself. When my husband got home, our evening was the usual buzz of activity, getting my son to his music lesson, me getting out for a workout, all of us bonding over dinner… and any feelings of guilt I had experienced earlier that day were melting away. 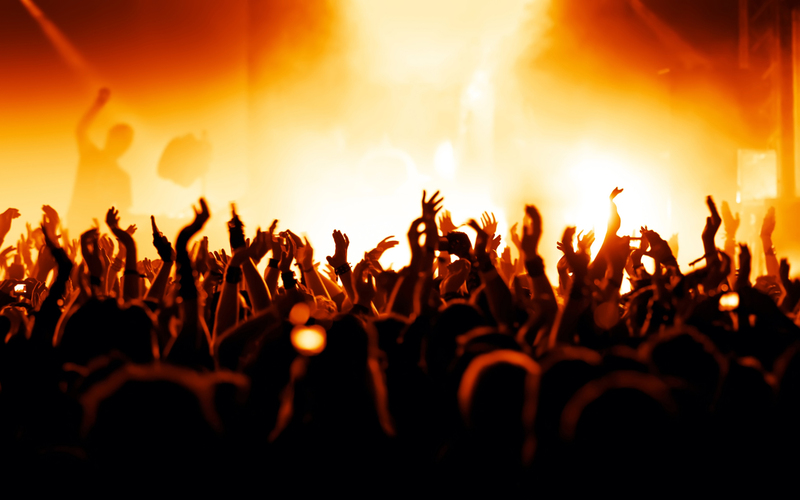 Just like our seats in the concert venue, our busy lives as real women are all about perspective. We do the best we can every day to be there for family and friends and co-workers, and to appreciate all that we have, no matter what our schedules dictate. And once in a while, we can take a step away from the usual routine and do something for ourselves, something out of the ordinary. We can give ourselves a boost and have fun, to feel cool and trendy, or just to feel at peace. The result is a healthier, happier us, which positively affects those close to us. True, I may not be able to be home every afternoon to welcome my son home with fresh-baked brownies. 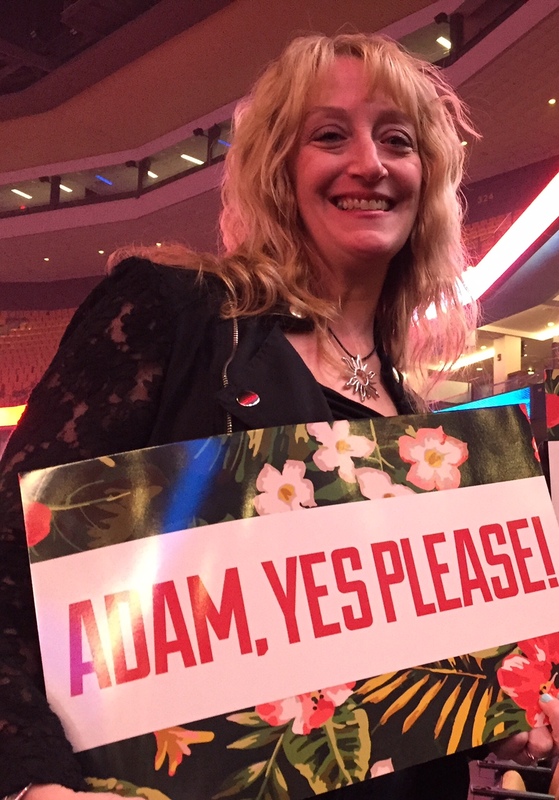 But he knows I’m still there for him every minute, now matter where either of us are… even if it means embarrassing him by texting him a photo of myself holding an “Adam, yes please!” sign at a concert. This entry was posted in Entertainment, family, friends, Kids, real women, Style and tagged BFF's, careers, concert, mom, night out, perspective, son. Bookmark the permalink.